Election Day 2012: New Jersey voters displaced by Sandy can vote by email, but it's not that easy. New Jersey voters displaced by Sandy (including first responders helping with disaster relief) will be able to vote by email or fax, announced the New Jersey Department of State on Saturday. The decision met was with relief by those who worried that Sandy would affect voter turnout. But those of us who dread the long Election Day lines shouldn’t be jealous—it turns out that voting by e-mail is way more complicated than it sounded at first. This is an expansion of a system already used for members of the armed services. Here’s how it works: Voters will first email (or fax, but let’s be honest about the chances of that method really taking off) a mail-in ballot application to their county clerk, who will confirm that the individual is registered to vote. Then, the clerk will send the voter an electronic ballot, which must be emailed back by 8 p.m. on Nov. 6. But that’s not all: TechDirt pointed out this morning that voters who apply for a ballot by e-mail also have to send in the exact same application by mail. If they don’t, they risk their vote not being counted. Election officials haven’t revealed what happens if they don’t receive the mail-in ballot application in addition to your e-mailed one. But “[i]t’s not difficult to imagine that these ballots will end up in court,” Andrew Appel, a Princeton professor who looked at the law that allowed New Jersey to vote by e-mail in the first place, speculated to TechDirt. Other details might also make things tricky for e-voters. For one thing, the actual ballot document doesn’t contain any fields for you to type in, so you have to print it out, then scan it back in to email to the county clerk—which might be tricky for the displaced. And while the deadline for a ballot to be emailed or faxed in is 8 p.m. on Election Day, the deadline to apply for one is 5 p.m.—a pretty narrow timeframe for a clerk to confirm that you are a registered voter and send you your ballot. Security blogger Mark Blaze, who weighed the risks and benefits of New Jersey’s e-mail voting system, argues that a system that worked well for a small group like overseas and military voters might not be able to handle the sudden influx. Let’s say that despite the potential pratfalls, New Jersey’s move to let displaced voters e-mail their ballots works. Could it give hope that the United States may one day join countries like Estonia in voting online? A survey by app company Stitcher suggested that 60 percent of Americans would gladly cast their ballots on their mobile phones. But in a great story on Technology Review today, David Talbot explains why voting online probably won’t happen for Americans. It’s not just the potential for lost votes that we have to worry about, he says—there’s also the prospect of skilled hackers stealing an entire election. Talbot gives an example of how Department of Defense halted a $22 million Internet voting system for U.S. military back in 2004 after finding it was vulnerable to cyber-attacks. 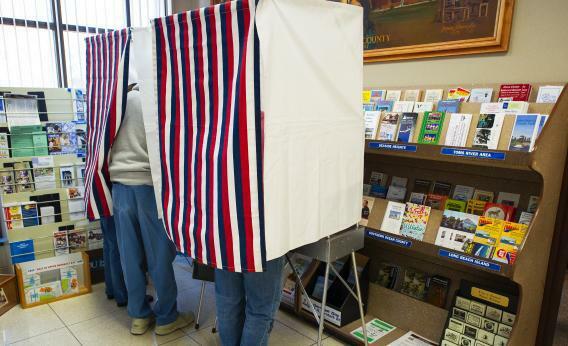 Americans may be ready to cast their ballot online, but technology and bureaucracy are not.